Groups are public to staff. Students, parents and Associates must be joined to groups; they can't join on their own. Students, parents and Associates cannot belong to district-wide groups. 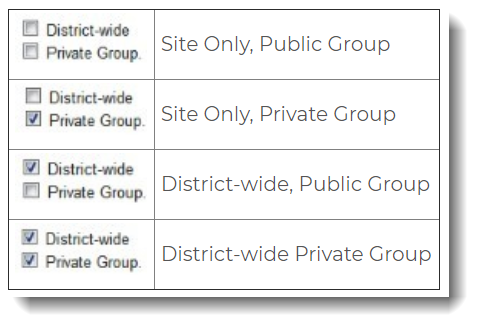 Note: Once a group is created, the optional Private and District-wide settings cannot be changed. If you made a mistake in the type of group you wanted, you will need to delete and recreate the group. Faculty and staff can now create private groups that cannot be seen by users who have not been added to that group's membership. With public groups, faculty and staff at a school site can see a complete list of groups at the school and are free to join any group they wish. Private groups allow for more discretion and control with regards to a group's membership, as new members can only be added to private groups by either the group owner, group admins, or users with administrator rights. Note: A private group member who has Webmaster or Editor rights has the ability to display the group locker on the website. Users with Site Admin and District Admin accounts will still be able to see private groups created at the school level and can also join these groups if they wish. These groups will be labeled Site/Private in the "Type" column on the Groups page. District-wide groups have most of the same features as site groups with the advantage of allowing membership from other schools in the district. District-wide groups can be either public or private. Note: The "Send LoopMail to Group" feature (Plus only) is not available and District-Wide groups are for staff only. Students and parents cannot be added to District-Wide groups. 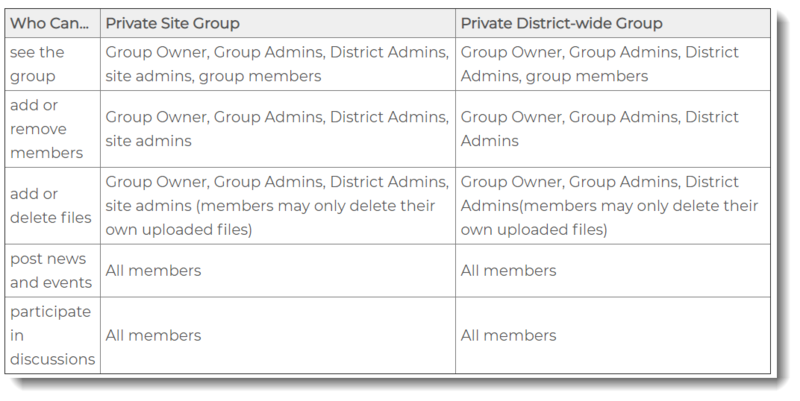 District-wide private groups can also be created by checking both options at the bottom of the create group page. These groups are only visible to members of the group and District Administrators. While school-level System Admins can see any private group at their school, they cannot see district-wide private groups unless they have been added to the group. The following table outlines the rights the rights associated with private groups.